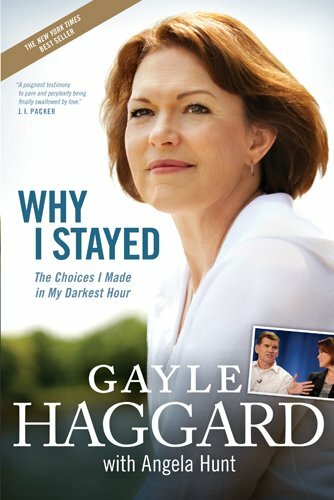 Gayle Haggard's Why I Stayed is a spellbinding book. My reflections, as I read it, revolved around three separate but related themes—marriage, mutuality, and "healing through meeting." We all see the stories others tell about their lives through the prism of our own. I am no exception. I have been married for fifty years this summer to Ron Sider. Since the late 1970s, we have used, as a guide in our marriage, a Christ-centered hermeneutic of biblical equality. 1 And, for twenty years until my retirement at the end of 2006, I learned much from others through my practice as a marriage and family therapist. Gayle Haggard is the wife of Ted Haggard and mother of his five children. After twenty-eight years of marriage, her husband—following a meteoric rise to evangelical prominence as the pastor of a 14,000-member megachurch and as the head of the National Association of Evangelicals (NAE)—was accused of having sexual relations with a male prostitute and the use of illicit drugs. In the drama-packed aftermath of that revelation, Gayle found a quiet, private space with her God in which she asked this question: "Who am I going to be in this story?" That night, she writes, "I began my journey of choosing—choosing to love . . . to press through my feelings of anger . . . to demonstrate my love by fighting for the dignity and honor of everyone and everything I held dear" (69). What follows is the story of a courageous, committed Christian wife, willing also to "wrestle with the truth [rather] than live a lie" (65). Gayle is a stellar example of a wife who took her cues from the inner still, small voice rather than from the direct and indirect popular messages she received from church and secular folk alike. She even disagreed with her therapists when they labeled her a "codependent" wife. A strong woman, indeed! I, too, believe their diagnosis missed the mark, but several puzzling questions remain for me. Those questions led me into my second set of reflections related to the type of marriage that Gayle and Ted had developed. A fascinating love story of two very committed Christians begins with a God-breathed evening beside a campfire when Ted shared what he believed God had called him to do and when he asked if Gayle would share that life with him. It was easy for Gayle to say yes to both that question and to the marriage proposal that followed. Gayle soon discovered that "life with Ted would always contain a dash of fun, drama, and the unexpected" (8). She stopped short of agreeing to spend their honeymoon on a weeklong group camping and backpacking trip. But she did decide to put her college career on hold soon after they were married in order to help run the American office of a new missionary organization in Baton Rouge, Louisiana. Ted had already spent time in Ghana with this missionary organization, and a future on the mission field was what they both anticipated. Those early years were more trying for Gayle than for Ted. Their responsibilities also included youth-pastoring and hosting guests who visited the church they had become part of—lots of interpersonal activities Ted thoroughly enjoyed. It was clear which one of them was the extrovert and which one longed for more private couple time. Several years and two children later, one evening, Ted told Gayle that he felt God wanted them to move to Colorado Springs and start a church there rather than go into overseas missions. On a recent trip to Colorado Springs, Ted had received from God several visions of a large church, a prayer center, a stadium filled with twenty thousand men. Gayle was dumbfounded, but trusted Ted's discernment; most of all, she trusted "God's guidance in our lives" (19). The pastor of their church in Baton Rouge, a kind of father figure to them both, did not want to see them go, but, after making a trip to Colorado Springs himself, he told them he agreed that God was leading them to Colorado. So they moved. "What is wrong with this picture?!" I wanted to ask. Before marriage, Ted and Gayle both heard the voice of God in their lives and were committed to follow where he led. But Ted was the one who shared God's vision for his life and then asked Gayle to share in that. After marriage, it was Ted who heard God lead in a new direction, and Gayle learned to accept that as God's guidance for both of them. Even their pastor had more input in the decision of God's will for their lives than did Gayle. There is no indication that anyone asked Gayle, "What do you hear from the Lord in this matter?" New Life Church, which began in January of 1985, "expanded at an amazing rate . . . grew by double-digit percentages every year for twenty-two years . . ." (20). Millions of dollars poured in to support missionaries and mission organizations. The World Prayer Center and Praise Mountain followed. Social services and civic engagement at home were also encouraged. A key ingredient to the church's success, Ted believed, was empowering people in the church to serve others. It seemed that the call of God and the faithful following of that call was yielding fruit, even one-hundredfold. Where did all this leave Gayle? The third of their five children is a special-needs child, and, under the leadership of a good friend, a new ministry brought special-needs children and adults to the church for worship each Sunday. But Gayle often felt she was parenting alone; it helped her develop compassion for single parents. Grateful as she felt to be called to her "role as Ted's wife and the mother of our wonderful children," she "carried a hidden heartache," but felt she couldn't talk about it "without feeling selfish. I wanted more of my husband" (24). Occasionally, the dam of pent-up emotions would break, and, as she puts it, "I would tearfully unload, nearly drowning him in a tide of reproach" (24). He would be shocked and surprised, and it seemed to Gayle that her outbursts were another burden on his shoulders. She would feel embarrassed, petty and possessive, emotionally needy. That is not what she wanted. She wanted to be strong, and so she resolved to deal with her feelings privately. "Prayer became my lifeline" (25). One thing that added to her longing for more emotional intimacy was the fact that the inner circle of senior staff members at the church—all men—became Ted's best friends and knew him better than she did: "In my mind, I had gone from being a ministry partner to being simply the woman at home—Ted's wife and the mother of his children" (27). "I wanted to be my husband's confidante and his best friend. I wanted to be the person he called first with good news, the person he ran to for comfort or to share a fleeting thought" (27). Realizing that those dreams would not be fulfilled in their present situation, Gayle "decided to be happy with my many blessings. . . . After all, I knew my marriage was still better than most" (27). "I had married a popular and successful man; now I was paying the price" (27). No! No! No! I wanted to shout. This solution is not what you should have to settle for. A marriage that leaves a husband totally fulfilled in his calling and leaves a wife with a deeply hidden longing she does not feel entitled to share is not a fulfilling marriage; it is not God's best for them. Later, following the disclosure of Ted's infidelity, therapists tried, unsuccessfully, to convince Gayle that she was codependent; she must surely, at some level, have been aware of his secret. She needed her husband too much, they suggested, and so she had unconsciously covered up his secret life for fear of losing him. She was too dependent on him to allow herself to know the truth. I think they were wrong. The woman I came to know in this book is not weak. She does not fear independence. If anything, she is too strong—and yet in an unhealthy way. She was "spiritually" so strong that she asked God to help her accept the loneliness she carried, stemming from the deep longing for a greater intimacy in her marriage. I am not in a position to comment on the possibility that Ted's secret life was part of what drove him to surround himself with people from whom it was easier to hide his innermost thoughts and struggles than he could from his soul­mate wife. That seems a logical conclusion, and I would assume that it was addressed during their time of intensive therapy in Phoenix. I am more interested in pursuing the systemic issue of "selficide"—the experience of women who sacrifice their own God-given calling, usually for the sake of their husband's career, or, in church leadership positions, where they are overlooked because it is expected that males will fill the role for which they are gifted and for which they sense a Spirit-driven call. Women who grow up in a culture that sacrifices their giftedness for that of males in their churches, whether it be their husbands or other males in a hierarchical structure, are left in a one-down position. When gender rather than giftedness becomes the criterion for performing certain leadership roles, then I believe the church has strayed from the teachings of Jesus, God in the flesh, the Light of the world, through whom we understand and interpret the whole of Scripture. Whenever Paul speaks of the gifts given to the church by the Holy Spirit, he says nothing about dividing them according to gender (e.g., Rom 12; 1 Cor 12). In fact, he explicitly says, "Now to each one the manifestation of the Spirit is given for the common good (1 Cor 12:7).”So in Christ Jesus . . . all [are] children of God through faith . . . all [are] baptized into Christ. . . . There is neither Jew nor Gentile, neither slave nor free, neither male nor female, for you are all one in Christ Jesus" (Gal 3:26-28). So, who is responsible when a devout Christian couple like Ted and Gayle grow so far apart, not only in their sense of emotional intimacy, but also in their awareness of the other's spiritual fulfillment? True, some of Gayle's fulfillment was restored when she was given leadership in the women's ministry. Even then, however, her husband's closest confidants remained the males who occupied top leadership positions with him. Was Ted responsible? Was Gayle? Was the rest of their congregation? Were the religious and educational institutions that encouraged leadership on the basis of gender rather than giftedness and calling? The answers to these questions have implications and applications far beyond this marriage and this church. I believe there is also a relationship between the gender issue and Gayle's major complaint about the "restoration" process used following the revelation of Ted's sin and his resignation from leadership at New Life Church. I first learned about that process when Gayle was interviewed on National Public Radio. As I listened, I was impressed with Gayle's clarity of thought and straightforward manner. Her style was compelling as she spoke of her strong faith in God, her choice to fight for her marriage and her family, and her disappointment with the way the church handled an admittedly horrendously difficult situation. Gayle used a family analogy, since that is what a church is supposed to be. If the church is a family, why did the rest of the church family not surround them with loving correction? In her more detailed written explanation about her disappointment, Gayle returned to the Scriptures: "Dear brothers and sisters, if another believer is overcome by some sin, you who are godly should gently and humbly help that person back onto the right path. And be careful not to fall into the same temptation yourself' (Gal 6:1). Instead of finding a way to extend grace, or to allow them to heal, surrounded by their church family, the four overseers and the church attorney, after brief, formal meetings, said they would need to leave permanently and move out of the state. Gayle had one brief conversation with three of the women she worked with most closely in which she asked them to take over the women's ministry. One elder couple also paid a brief visit to their home, and then, as Gayle put it, she was "torn from my friends in my darkest hour." She described the "deafening silence" they heard following the overseers' strong instructions: No one in the church was to contact them, nor were they to contact anyone in the church—and certainly not the media—without the consent of the church overseers. Although their teenagers and young adult children were allowed to remain in the church, Gayle and Ted were left alone. They spent their first week in Florida, a blessing in disguise. This became the forum in which the two of them were able to engage in the numerous, painful, face-to-face conversations so essential to begin the restoration of trust between them that had been totally shattered. Soon after, they moved to Phoenix for some intensive counseling—painful but enlightening. During all this time, they were to be shepherded by three "restorers," all male, who were spread out geographically and were all too busy to be available to develop a close relationship with them. In fact, they saw them very little. At the same time, the media was spreading ever-increasing allegations about Ted, based on mostly false rumors related to homosexuality and illicit drug use. Not able to respond to any of it, Ted offered to take lie detector tests while in therapy. Both tests that he took showed him to be telling the whole truth—unlike his initial instinct when news reporters first put a microphone in front of his face. Still in shock at that point, Ted reverted to his face-saving denial mode. Now, in the process of deep self-searching and struggling to understand his thoughts and behaviors with the help of trusted therapists, he was hoping that those who did have the authority to speak for him—the three overseers at New Life Church—would make public what was true and what was false on the basis of the lie detector tests. Whether out of fear or a total lack of trust, the overseers never released the results and never, publicly, spoke favorably on Ted's behalf. The three respected church leaders who had been named as restorers did, following one lengthy meeting, advocate on behalf of Ted and Gayle, softening a number of the more painful barriers and restrictions in the overseers' written contract. With gratitude, the couple breathed a sigh of relief, only to be crushed once more when the original written stipulations were shortly reinstituted—with one notable exception. For the sake of the family, they were allowed to move back into the house they had not yet sold. With that major change, they felt they were able to begin to repair some of the broken relationships in their lives. Around that time, they also decided to speak again on their own behalf to the media. Any legal action, which the church could have taken because the silence had been broken, never materialized. "Healing through meeting" is a phrase central to the trust-building, direct-dialog style of family therapy espoused by Ivan Boszormenyi-Nagy, Barbara Krasner, B. Janet Hibbs, and others under whom I studied.2 This approach emphasizes "the between" in human relationships, that face-to­ face meeting space where trust can be rebuilt and relationships restored-where healing can occur. I was ready to applaud when Gayle began describing the "healing meetings" they began hosting as people came back into their lives, a few couples at a time. Gayle spoke of these gatherings as having "one primary purpose; to give Ted an opportunity to apologize and to listen to the people he's hurt" (316). This is what Jesus and the writers of the Epistles taught us to do, if we have wronged or been wronged, and to do it in the spirit of humility, recognizing our own vulnerabilities. What Ted and Gayle discovered in those healing meetings is a direct dialog that did indeed restore trust and lead to interpersonal healing, the ultimate goal of any restoration process. How sad when our "church discipline" majors on separation as the path to restoration (307); on keeping both offender and spouse quiet and out of sight. Gayle summarized the process at New Life Church in this way: "They talked about us every week, forming conclusions and making decisions, yet we were excluded from having any input. . . . Plenty of decisions were being made 'about us without us.' Ted and I believe that people—all people—should be respected enough to be brought into the dialogue, particularly when it affects their lives" (271). Where were the women's voices? So why did I begin this book review by alluding to the male/female equality and mutuality in marriage? What is the relationship between the gender issue and the restoration process? What made it go awry at New Life Church? Many factors, undoubtedly, were involved. The one that struck me most forcefully, since I was already asking about the effect of gender discrimination in Gayle's life, was the effect of having an all-male delegation (four overseers from the church and three restorers from outside the church) responsible for the restoration process. In the church family, where were the church mothers or sisters? Outside the church, why did no one consider that Gayle might benefit from the hug of a sister in church leadership, or at least the wife of a man in leadership to whom she could pour out her heart and with whom she could process what was happening to her? Instead, their "restoration" was in the hands of three men with limited time and little authority other than to rubber-stamp what four male overseers had already decided. Had there been two women from the church among the overseers, would they have been able to face Gayle and Ted with a "restoration plan" that "consisted only of a series of steps to permanently sever us from New Life Church" (211)? As Gayle puts it, "We knew other people hated what was happening to us, but they'd been told it wasn't godly to speak against their spiritual authorities" (211). Spiritual authorities sometimes overstep their authority out of fear—fear of losing control, fear of being wrong, fear of admitting they are wrong and asking for help. Some spiritual authorities, on the other hand, thrive on appreciation of their giftedness and lose sight of the fact that they are being put on a pedestal. This, it seems, is what happened to Ted Haggard. And, when one is on a pedestal, the only way to go is down. Gayle discovered that even she was sharing that post with Ted. When she and Ted first began some direct reconciliation dialogue with four of their (male) best friends, one of these men told Gayle she was being treated in the same way as Ted because "it's always been you and Ted at the top, Gayle" (227). A bittersweet moment for Gayle! Bitter because she had not viewed either one of them as being on a pedestal, and sweet because, in that statement, her friend had left her, as she put it, "alone by Ted's side. I had inherited the cherished position of [being] my husband's best friend." During this whole painful process, Gayle's desire for a more intimate relationship with Ted had been restored. For Gayle, the message from God was, "It had to happen this way"—for both of them! "God answered both our prayers. Mine for intimacy; Ted's for freedom from his compulsive thoughts that led to his sin" (346). Without taking away from all that God taught Gayle and Ted during these three dark and lonely years, I believe there is this additional lesson that many churches can take from it: When churches claim that they believe in the "priesthood of all believers," that "all have equal access to God" (222), and yet 50 percent of the congregation is limited in terms of the gifts they can exercise, the whole body will suffer. The hierarchy of male leadership contributed to the heartache in this marriage and in New Life Church. Even earlier in their marriage, we saw the expectation that a drastic change in Ted's life calling would be followed without input from Gayle about what God's call was for her. This is not the priesthood of all believers. Having exclusively male voices speaking into their lives with authority during the "restoration" process is not the priesthood of all believers. The fact that one man was put on such a high pedestal, I believe, is also due to the fact that the church functioned under a hierarchy of leadership that gave women a secondary position. "Gender and giftedness" rather than "giftedness and calling" as the primary qualifications for senior leadership in churches is not honoring the priesthood of all believers. I focus on the issue of gender equality because I see it as one relevant biblical issue not addressed directly in this book. Yet, to me, it was the unacknowledged elephant in the room. I write to invite more discussion on this issue. I don't know who you are married to, so I can't presume to know the best course for you. Ted gave me the gift of repentance, and he chose, as I did, to heal our marriage. But I know that not all men choose to do that. Even so, I encourage you, as much as you are able, to do what Jesus instructed us to do: forgive and love. Only you can determine what that will look like in your life. 1. That is, I became a biblical feminist, and Ron—well, he tells it best himself as one of the voices in How I Changed My Mind about Women in Leadership: Compelling Stories from Prominent Evangelicals, ed. Alan F. Johnson (Grand Rapids, MI: Zondervan, 2010). 2. I. Boszormenyi-Nagy and B. Krasner, Between Give and Take (New York, NY: Brunner/Mazel, 1986); I. Boszormenyi-Nagy and B. Krasner, "Trust-Based Therapy: A Contextual Approach," American Journal of Psychiatry 137 (1980), 767-75; B. Hibbs, Try to See It My Way: Being Fair in Love and Marriage (New York, NY: Avery/Penguin, 2009).